Brother Jesse Blog: T.I. comes to Houston and speaks at Texas Southern University! I was blessed with the opportunity to be one of the co-coordinators of the Responsibility is a Lifestyle: Give Back Your Gun Day on March 14 in partnership with Rapper T.I., the K.I.N.G. Foundation,Political Swagger.com, the C.H.A.N.G.E. Initiative, Houston City Councilmember Johnson and many others. This event was pulled off in one week. It showed me that when one eliminates excuses and joins forces with groups in your community like the Houston Crime Coalition, you can do great things in a short time. Hundreds of people came out to Texas Southern University on one of the rainiest days of the month to not just see T.I. but to hear positive messages and go to work to build our communities. I will be posting more pictures and more detailed coverage of this event real soon and plus in an upcoming edition of The Final Call. I am seen pictured above with (r-l) DeeDee Murray (Executive Dir. of the K.I.N.G. 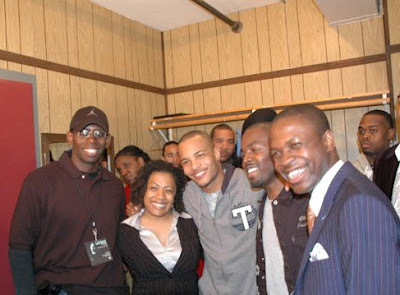 Foundation), Rapper T.I., Music artist Radiant Amar(Co-Founder of the C.H.A.N.G.E. Initiative) and Brother Hasaun (Co-Founder of the C.H.A.N.G.E. Initiative). The work continues....Let's Be The Change.